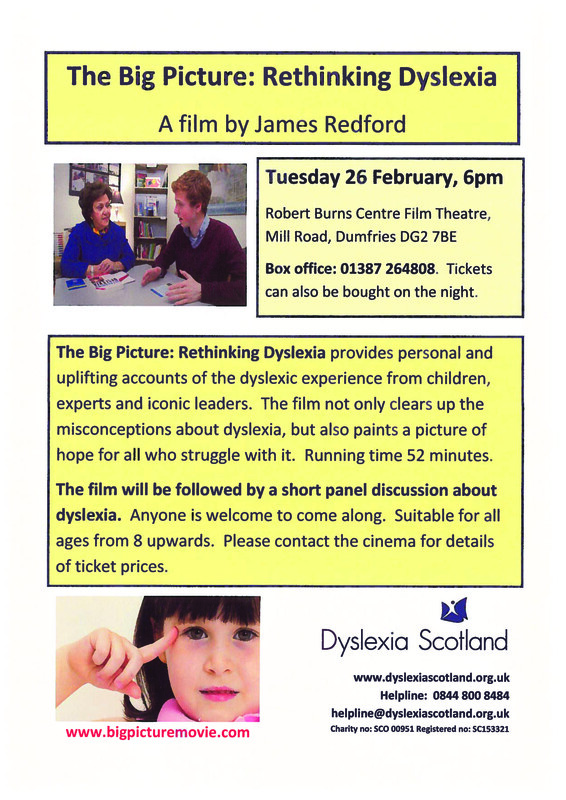 We know that dyslexia affects people all over the world but we were intrigued last year when we were approached by American film maker James Redford – yes, that Redford family – about a film he had made about dyslexia. James, Robert Redford’s son, and his wife had struggled to support their dyslexic son Dylan for years and the film explores the family’s experiences over the years. It also features a host of other dyslexic people from all walks of life including people like Sir Richard Branson and leading financier Charles Shwab. These public figures might be incredibly successful now, but they talk candidly about how they struggled earlier on in life and how they used their strengths to get where they are today. 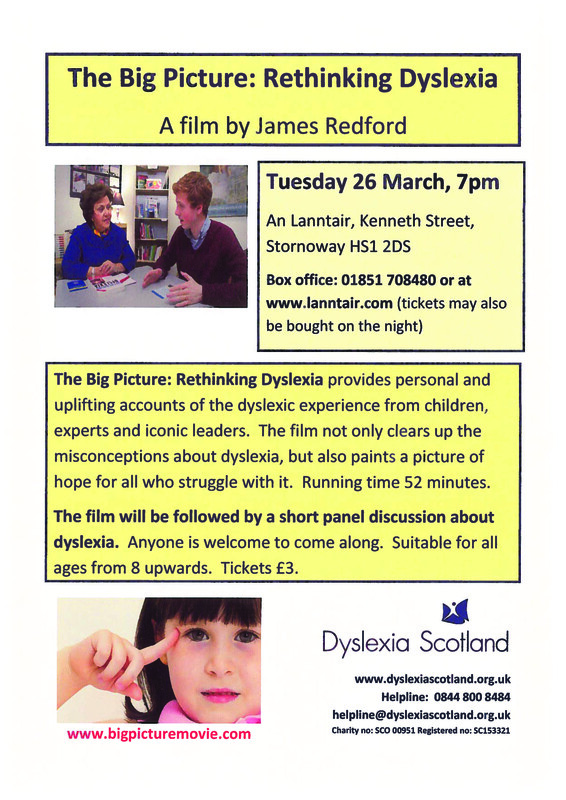 Initially it was decided that we would show the film during Dyslexia Awareness Week, but we did wonder – would a film like this work in the UK? The answer was a resounding YES and following lots of interest we have arranged some further screenings in Scotland starting in Dumfries next week. You will also get a chance to see it if you live near Stirling, Stornoway or Glasgow so check out the Events page of our website to find out more. 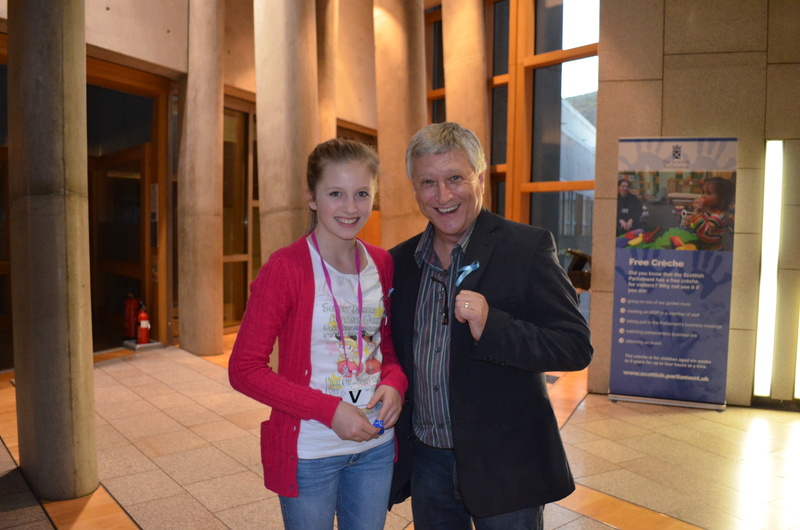 The Young scot contacted Lena from Dyslexia Scotland who then contacted my Mum to ask they if they could interview me and put the clip on their website and YouTube channel during Dyslexia Awareness Week, so that was my next stop. I really enjoyed being interviewed and was so grateful to DS for setting up a twibbon link where all my friends on facebook and famous people on twitter could put a blue ribbon on their page during DAW. You can see my clip on You Tube here. 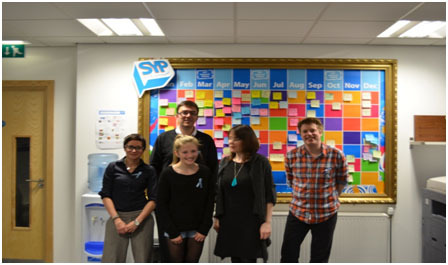 The Scottish Youth parliament held their big conference during DAW and they all wore my ribbons, Kate who works for the SYP told them about my campaign, she said they were all very impressed. Next, I took my ribbons along to CALL Scotland. This is an organisation that creates software for children with SEN’s , they make a lot of things like school textbooks accessible for lots of children who can’t read very well or have problems accessing the text. Allan Wilson who works there has helped my sister and me a lot with our computers and IPads. They were having a meeting that day with people from different councils who visit lots of schools, Allan helped me tell them about my campaign and we gave them all ribbons. 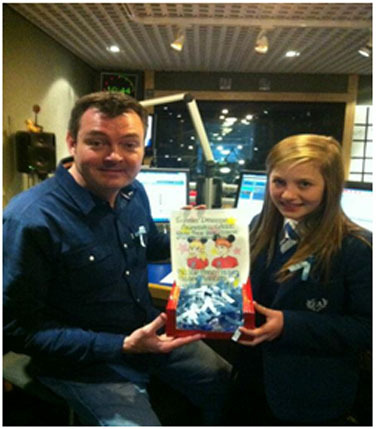 Next stop, Forth One where I met the celebrity DJ Grant Stott, he was really impressed with what I was doing and said he would give all the people at the radio station a blue ribbon. He said that he would wear one and tell everyone what it was for. It was really really cool visiting him as I got to go into his studio while he was live on air!! 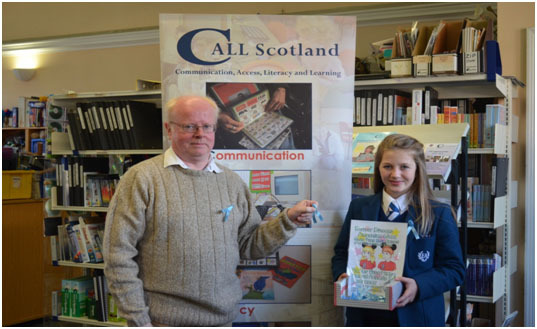 The opening of Dyslexia Scotland’s DAW was happening at The Central Library in Edinburgh, Cathy Magee who is the Director of DS asked if I would like to attend. 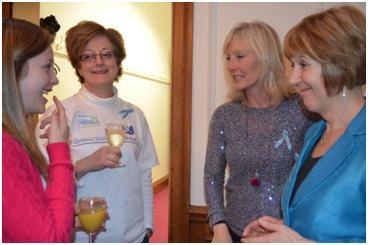 I was invited to the special drinks and nibbles beforehand and talked to people about my blue ribbons. Cathy had organised to have Keith Cook Fencing Champion and the man who owns The Tiso Outdoor companies to come along and give a speech then answer questions. Cathy asked me if I would like to take part and be on the panel. I also gave a little talk to everyone about my blue ribbons. I was delighted and everyone seemed to be very interested and fashionably impressed by my idea. I discovered that I actually like public speaking and I think I am good at it! Next Stop .. The Edinburgh Filmhouse. 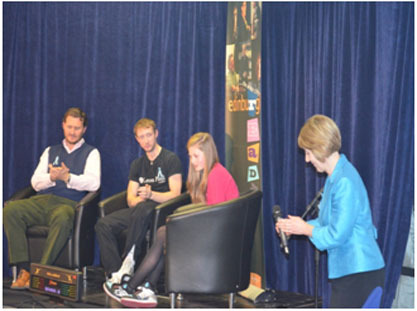 As part of DAW they were showing a film about dyslexia and Cathy had organised another panel which I was to be part off. Moira Thomson (my mentor for the project) and my dad came along with me. We gave out blue ribbons before the film and afterwards I answered some questions about my dyslexia and how it affects me. I think I gave positive answers to people as I wanted them to realise there is always a way to achieve, sometimes you just have to persevere in finding it. My Next Stop was The Lord Advocate. My Mum, sister, Anne Warden (my dyslexic tutor), Dawn, Niamh and of course me, all went along. Dawn works in the court offices and she had been giving ribbons out all week but she did not expect to get the response she did. People started talking about dyslexia and others said they were dyslexic , that is the thing everyone knows someone who is dyslexic or they are dyslexic themselves. This was great news; my campaign was really working and raising awareness. When I met The Lord Advocate, he told me that someone who is willing to speak out about their difficulties needs courage but for someone to speak out for everyone else takes someone really special. He was very interested in my campaign and asked if I would like a job in the media because he thought my interview was so good. We had a lovely chat in his very impressive office and I am glad I am not reading all those books he has there! 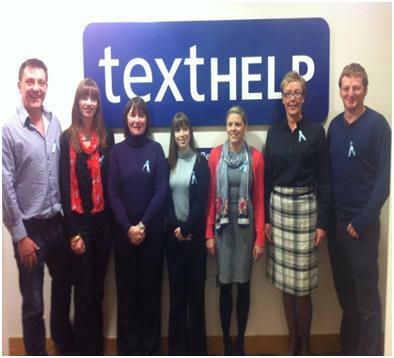 When I was on the internet I noticed textHelp (a company that make software that can help dyslexics) had some comments about my blue ribbons on their twitter page, my mum helped me get in touch with them and we sent them some ribbons. 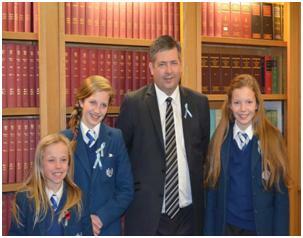 My Blue ribbon Campaign has been a fantastic success because of all the people that have helped and joined in. Lots of other children from other schools asked their schools if they could join in and they all said YES. My own school gave out ribbons and everyone had them on their blazers for DAW. Sciennes primary, Heriots, Watsons, Firhill, Edinburgh Academy, Dunedin, Kings Park , Lasswade primary, Loanhead primary, Paradykes primary, Drumbrae library, Oxgangs Library, The Edinburgh Filmhouse, Young Scot, Grant Stott Forth One, The First minister, The Minister for Learning, Scottish Youth Parliament, Margaret Mitchell MSP and Kate, Texthelp, The Lord Advocate and the court offices, Sir Jackie Stewart, Jennie Guise and Dysguise, Brenda Rainford, CALL Scotland, SCIS, Castle brae primary, Niddrie primary, Anne Warden’s pupils, DS Ayrshire, DS Forth Valley, DS council, DS Borders, New battle community Centre, Camilla Leslie, My Grandpa Des’s school board of Governors, Keith Cook , STV, The Evening news, Everyone at Dyslexia Scotland and DSSE for distributing them to friends and family. 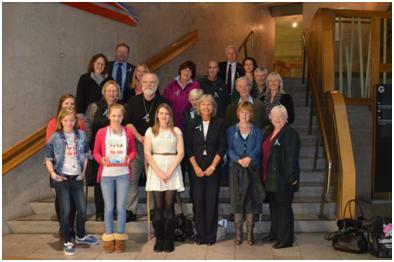 I must not forget that The Edinburgh Evening News put an article titled “Girls goes to Parliament over Dyslexia” in their newspaper and STV news aired a piece on the television where they interviewed my sisters and myself about our dyslexia and Cathy Magee spoke about how dyslexia can affect people’s lives. I have had a great time organising and carrying out my campaign and I would like to thank everyone at Disney for making it possible. I could not have done all this myself and I am especially grateful to my Mum and Dad for being there, Moira for supporting me as my mentor, Anne and Lisbeth for coming to all the appointments with me, and DSSE for helping me. 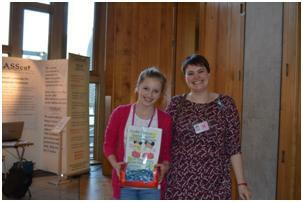 Phoebe, my sister for taking all the fabulous photographs and Bryony for designing my posters and t-shirts. 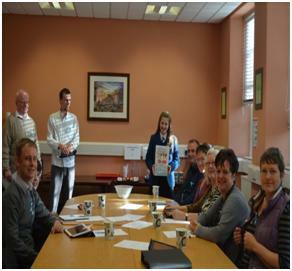 Everyone at Dyslexia Scotland for getting on board and supporting me and letting me take part in all their DAW events. 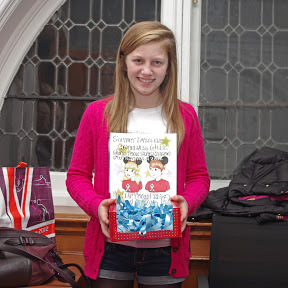 My name is Ellie, I am 12 years old and I am dyslexic. I have three sisters, one is dyslexic, one is dyspraxic and my youngest sister is dyslexic and dyspraxic. We all need allot of extra help with learning and every time we get a new teacher my mum has to explain our needs all over again. My mum is on the committee of Dyslexia Scotland South East and I helped her last year when she was making up information boxes for schools during Dyslexia Awareness week. It felt good to be helping to raise awareness because dyslexia seemed to be invisible somehow. This made me think about how we wear poppies to remember soldiers and pink ribbons to raise awareness for breast cancer so I decided wearing a ribbon could help raise awareness for dyslexia. At first I thought I would just get some ribbon and ask my friends and family to wear them during Dyslexia awareness week but then my mum told her committee and they all thought it was a great idea and even said they would pay for them and help to get other people to wear them to. One of the committee members told me about the Disney friends for change Youth Service America who give out grants to help young people like me to fund their ideas. So I applied for a grant to buy my ribbons. When I applied I had to think about my aim and goals for this project. 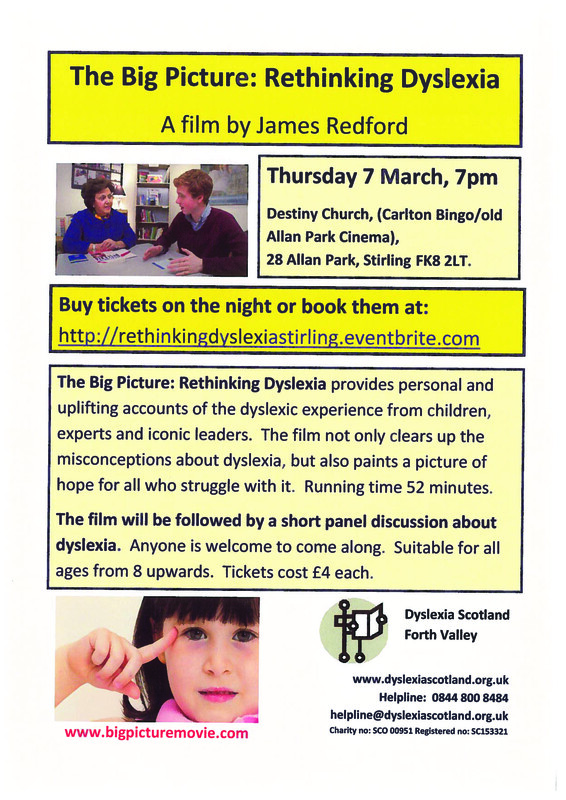 To raise awareness and a better understanding of dyslexia in Edinburgh, the Lothian’s and around Scotland. 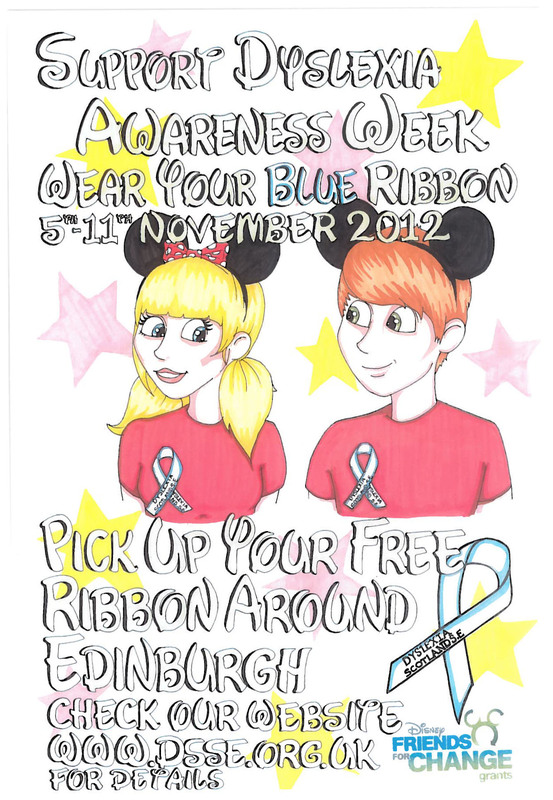 To distribute ribbons in local schools, local libraries and in the Scottish parliament. 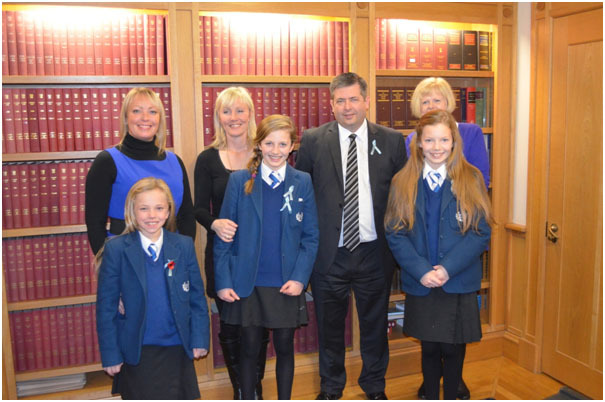 A long term goal is for the ribbons to be known as the Dyslexia Awareness ribbon in Scotland and for people to wear it during Dyslexia Awareness week every year. By making more people aware of what dyslexia is and how it can affect learning I hope to help other children not to be embarrassed about their dyslexia and not to hide it. My sisters and I would really like people to know how difficult life can be for dyslexics (and dyspraxics) and to learn about the challenges we face every day. I would like everyone to know that people with dyslexia are not stupid, they just learn in a different way. I think it would help remove the stigma sometimes attached to being dyslexic and some of the weird things people believe about those who have dyslexia. When I received the grant from Disney I had a look online and chose what colour and design of ribbon I would like. I chose light blue with Dyslexia Scotland SE printed on it. 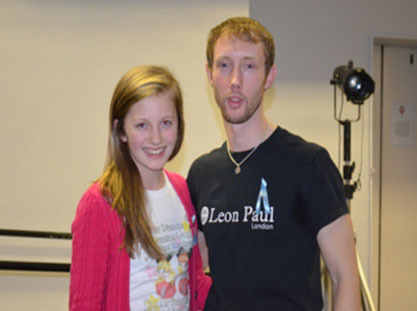 I got my older sister Bryony to design a poster which had the Disney logo on it and had posters and t-shirts printed. 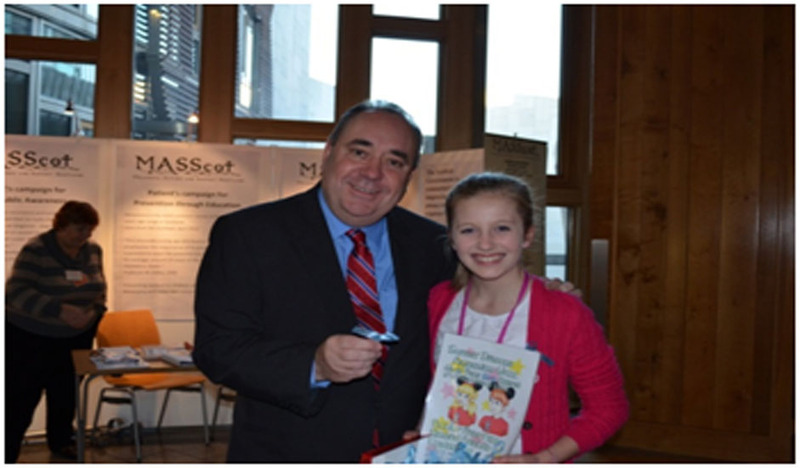 I decided to write to The First Minister Alex Salmond to ask if I could come along to the Parliament to meet him and give him one of my ribbons to wear. I believe that if changes are made in schools then he is the person that can do it. 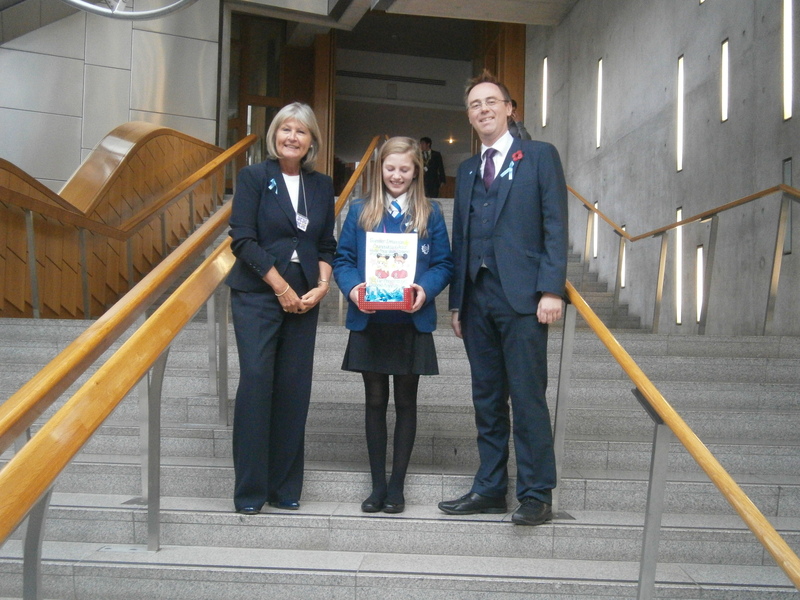 The Parliament wrote back to me and said The Minister for Learning Alistair Allan would like to meet me, I was delighted and when I went to the Scottish Parliament I met not only The First Minister but also the Minister of learning and Margaret Mitchell MSP. We spoke about Dyslexia, my campaign and how dyslexia can affect people and I asked them if there was anything they could do to help teachers understand. 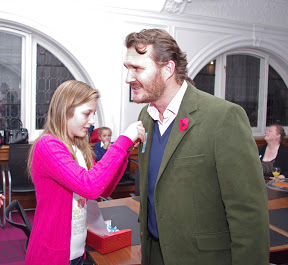 They were attending a debate that evening in the main Chamber which was on Dyslexia and they invited me along. The debate was very interesting and all the MSP were talking about me. This made me realise my campaign was working! I left a box of Ribbons in the parliament for other members to pick up and wear. Kate who was a lovely lady who helps organise things in the parliament told me she would distribute them the next day. 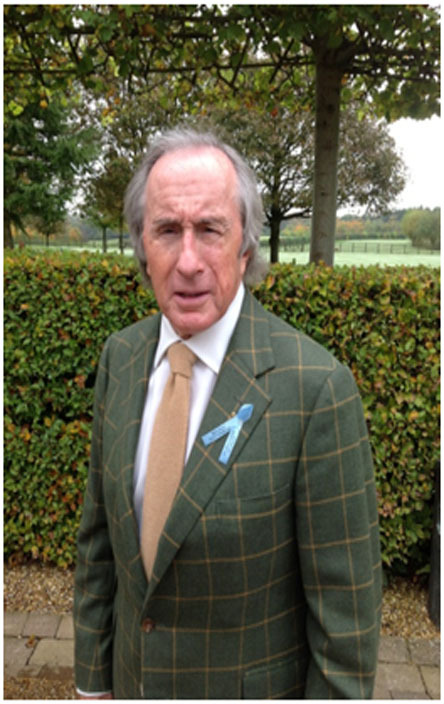 Imagine, Jackie Stewart writing to me! I sent him some ribbons and he sent me a picture of himself wearing it, all of his office staff were wearing them too.